For the past several months, I have been articulating the Lake Minnetonka Association’s vision for Lake Minnetonka. Those columns have described the various elements of our vision and here I want to put them all together. I have made the case that 1) milfoil remains the number one problem in Lake Minnetonka, 2) there are new restorative technologies available for lake-wide milfoil control, 3) zebra mussels and several additional exotic plants, animals and viruses are nearing Lake Minnetonka, and 4) we lack a comprehensive protection plan. Added to this list is the fact that our investment in protection and control for aquatic invasive species (AIS) is woefully insufficient. The Lake Minnetonka Association’s “Milfoil-Free Minnetonka” campaign aims to provide a mechanism for protecting and managing Lake Minnetonka – arguably the most significant recreational lake in the state and certainly the economic engine for the communities surrounding the lake. Milfoil-Free Minnetonka is about ridding Lake Minnetonka of milfoil and preventing new AIS from gaining a foothold in the lake. We now know we can accomplish the former, albeit at a cost, and we believe we can accomplish the latter, but only if we change the game. There are two significant hurdles – funding and attitudes. I have done an analysis of the funding needs for accomplishing our vision based on a program analysis and comparing to what other lakes spend for these activities. Simply, the funding needed to adequately protect and manage Lake Minnetonka for AIS concerns is about ten- to twenty-times what is now being spent. For example, Lake Manitou, Indiana, spends about $500,000 per year for their hydrilla control program. Lake Manitou is 700 acres, so by comparison this lake spends about 5-times more than Lake Minnetonka and is 20-times smaller. This funding gap should not be a surprise as Lake Minnetonka is really of a size and complexity to be more like two dozen lakes. The LMCD has a statutory funding cap which means it cannot adequately address these needs. Also, other agencies, such as the Minnehaha Creek Watershed District and the MN DNR, defer much of the AIS program activities to the LMCD, so in effect the LMCD is left high and dry to manage these concerns without sufficient resources. The Lake Minnetonka Association has recommended new ways of funding to address this shortfall. We have recommended fees for boats using Lake Minnetonka, but there may be other mechanisms as well. Mayor Chris Lizee of Shorewood has shown leadership in proposing to establish an environmental fund that would support these kinds of activities. This fund would be established by investing the proceeds from the sale of the City’s liquor stores. As well, Lake Minnetonka is a regional asset and therefore some kind of regional funding is also appropriate. It is easy to be complacent in the face of the AIS challenge. As Pete Nelson, former Director of the LMCD said, “the only thing harder than zebra mussels to eradicate is the notion that their introduction is inevitable.” And, even if zebra mussels get into the lake, we must not let up because each new AIS diminishes the integrity of the lake ecosystem. As well, unlike milfoil, which can be controlled, most new AIS have no remedies – none! So, if zebra mussels get in, they will change the way milfoil grows, most likely more aggressively. Then if rusty crayfish (or spiny waterflea or hydrilla or VHS or ???) get in they will arrive in a system that is already stressed and their impacts will become synergistic – and not in a good way. Each of these action steps has a more detailed plan, some of which have already been described in previous columns. Three and four decades ago, Lake Minnetonka was a pea soup of algae. 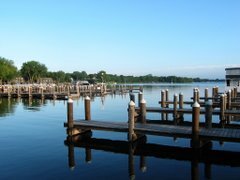 The community took action and now Lake Minnetonka is markedly improved. In that case the pollution causing the stinky algae was diverted and the lake responded. I believe the impacts of AIS to Lake Minnetonka can be more severe than sewage pollution. Unfortunately, we cannot ‘turn off’ or divert AIS introductions. However, the model of community action and investment has succeeded in the past and will succeed again. Let’s make Lake Minnetonka milfoil-free. Thanks for being so diligent about fighting the milfoil. It's so much better than how many people just throw up their hands in reignation.